Back in 2007, scientists found evidence of our planet's first continents in the form of 4.3 billion-year-old diamonds—old as the very Earth itself. And these diamonds were finally going to give us the insight into the evolution of Earth's crust that we've been searching for. Now, six years later, there's just one little problem: Those tiny gems? Actually tiny leftover bits of polishing grit. Whoops. 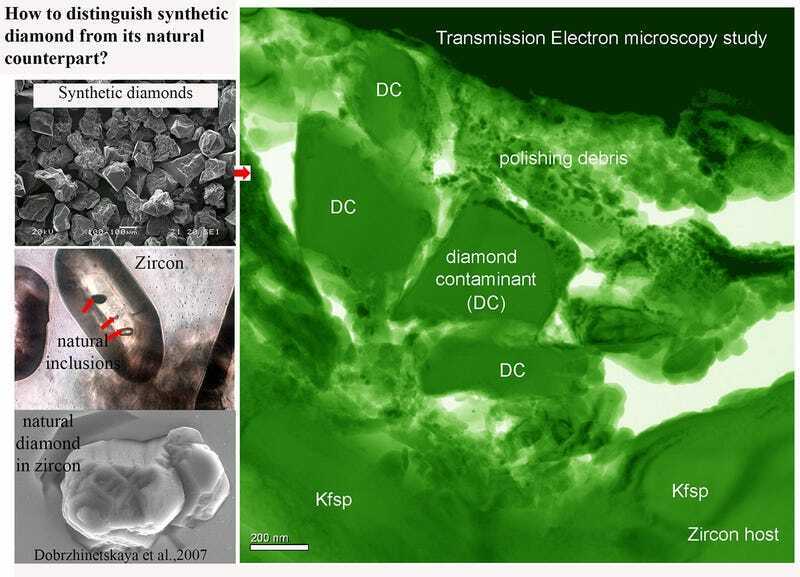 The team of international scientists responsible for the "discovery" had reported uncovering these potentially elucidating, microscopic diamonds in the inner pockets of zircon crystals from the Jack Hills of Western Australia. They just didn't take into account the fact that the polish they used to prepare the zircon samples was made of—er, microscopic diamonds. But at least for the time it seemed true, it was an exciting discovery. The fact that diamonds existed in this ancient mineral meant that the Earth had been cool enough to form a solid continental crust. Before this, geologists had believed that the Earth had been completely coated in a sea of lava for its first 500 million years; these diamonds would have (at least partially) disproved that. Recently, though, Scientists at the University of California, Riverside (UCR) took pictures of the purported diamonds using a powerful transmission electron microscope—one that hadn't been available to the polish-happy professionals before them. Instead of the bumpy, irregular shape of real diamonds, scientists found the sharp, uniform edges indicative of artificially created diamonds. The kind of artificial diamonds one might find in, oh, polishing grit, for instance. There can be no doubt of the images we show. Polishing the specimens with grinding compound that was made of diamonds was a terrible mistake. The early Earth was called Hadean for a reason. Personally, I disagree with that because I think we've found legitimate [zircon] inclusions of other low-temperature minerals, but I don't think we've found diamonds.